Links to news sources are on another page. Links to armed groups' sites are on the "information about the combatants" page. The sites linked from this page are not on the CIP server. If you find a "broken" link, please write us. Please notify us as well if your site is not included here -- it's not that we don't like you, it's just an oversight. America's Forgotten War: testimonies from victims of Colombia's violence, plus other background information. Wide Angle - Colombia: a briefing, "handbook," photo essay and other resources accompanying an edition of the PBS television program that aired in September 2004.
www.colombiamobilization.org: a national coalition of organizations and individuals working to transform U.S. policy toward Colombia and the Andean region. 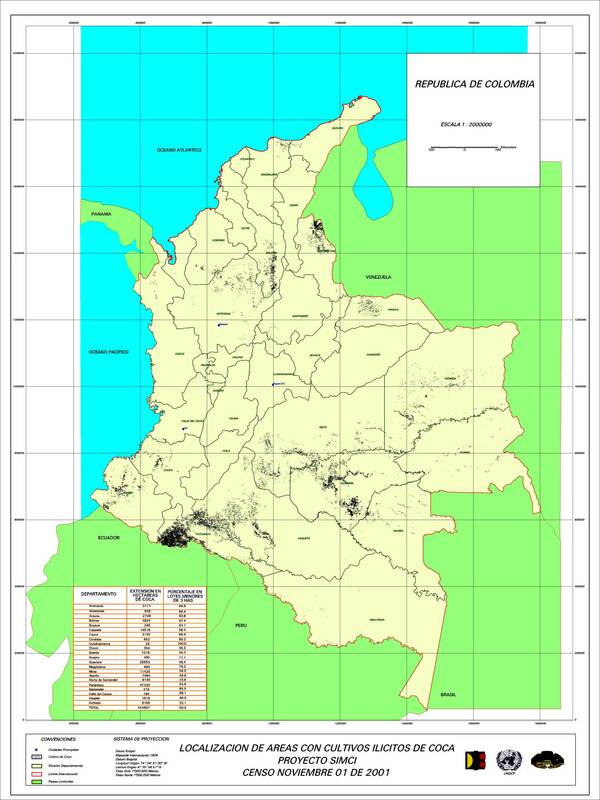 Locombia: an internet forum about Colombia, its culture and the conflict; goal is "to tell the truth about Colombia, the good and the bad"
[Español] Fondo de Inversión para la Paz: Colombian government agency that finances projects and programs to "create conditions of peace"
Map (.jpg file): Coca cultivation in Colombia, 2001. Drug Reform Coordination Network: a national network of more than 21,000 activists and concerned citizens; includes news, publications and an online "drug library"
[Español] Dirección Nacional de Estupefacientes: reports and other information from the Colombian government's "drug czar"
[Español] Coordinadora Nacional de Cultivadores de Coca y Amapola (COCCA): "For the substitution of coca and poppy crops within the framework of profound social, economic and political transformations"
[Español] Corporación Unidades Democráticas para el Desarrollo (CEUDES): Colombian organization that emerged from 1990-1991 peace processes and works "to promote the rule of law and participative democracy"